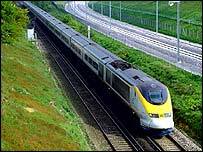 London's rail passenger watchdog has attacked plans to introduce new commuter services on the high speed Channel Tunnel Rail Link (CTRL). The London Transport Users Committee (LTUC) said it was "likely to inconvenience and upset everybody". It said the assumption that a large amount of Kent commuters would transfer onto new domestic services into St Pancras was "seriously flawed". It is calling on the Strategic Rail Authority to rethink its plans. The LTUC said if the plans went ahead many trains would go to places where passengers did not want to go and would cause severe peak period congestion. The CTRL domestic trains station at St Pancras was approved in the expectation that Thameslink 2000 would be in place to distribute passengers to their final destination. But the earliest Thameslink will be up and running has now been put at 2012. The LTUC has said that the SRA's Integrated Kent franchise proposals will result in overcrowding at Kings Cross St Pancras and on underground routes serving the station. Proposals also include some trains running to Cannon Street instead of Charing Cross. There are fears this will result in longer journey times and increased congestion at London Bridge. The LTUC said it did recognise some benefits from the plans such as improvements in frequencies - mainly in the off- peak services, but said these were outweighed by the downsides of the proposals.